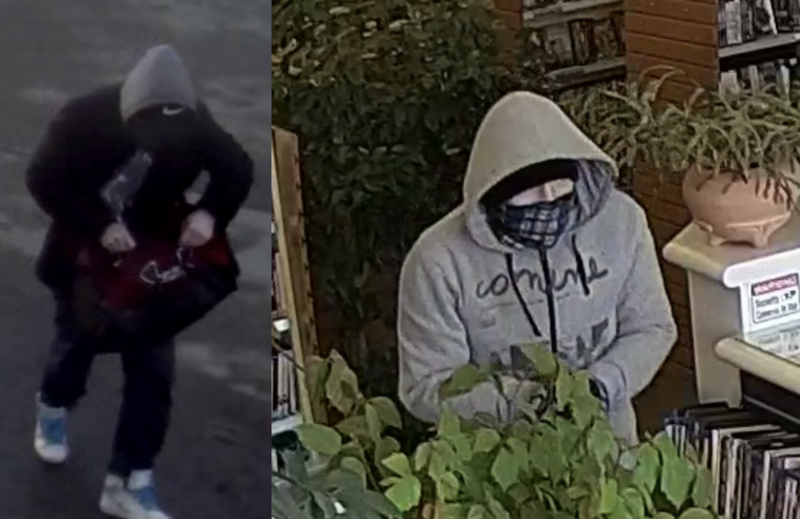 The Movie Mart on St. Paul Street was robbed for the second time in just over a week on Saturday afternoon (Jan. 19 2019) and police are asking for the public’s help in identifying two suspects. At 1:10 p.m. Saturday, a man entered the store with his face covered and carrying a box knife, then jumped over the counter and forced an employee to open the cash register. RCMP said he took money from the register and left the store heading west on St. Paul Street, then south again through the East parking of the Double Tree Hotel towards the back alley. The clerk was not injured. – Wearing: Black toque, black bandana, grey zipped up hoody, blue jeans, grey runningshoes and black gloves. – Wearing: Black baseball cap, black pea coat with a grey hoody underneath, blue jeans,and white running shoes with light blue shoe laces, carrying 1 red “Under Armour” medium size duffle bag. Police aren’t able to confirm whether the robbery is related to the earlier one.